The Rev. James J. Maher, C.M., president of Niagara University, addresses the audience during the institution's commencement ceremony Wednesday night in Toronto. 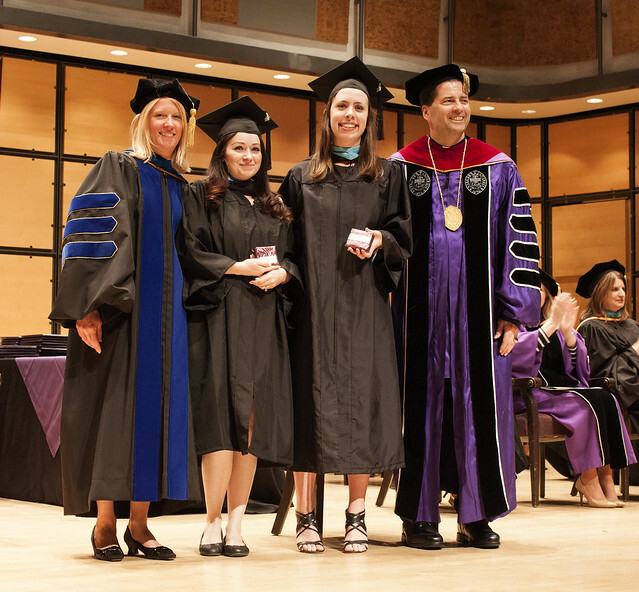 Niagara University’s College of Education awarded degrees to 122 graduates during its 11th commencement in Ontario on Wednesday, May 23, at the Toronto Centre for the Arts in North York. Robert Cutting, a Catholic educator in Ontario for more than 40 years, delivered the commencement address with the deft pacing and intonation of a seasoned, master storyteller. Upon receiving the Ozanam Medal from the Rev. James J. Maher, C.M., president of Niagara University, Cutting told the new graduates that “education is the key to everything” and to choose their words wisely as they begin their careers as teachers. Cutting began his teaching career in 1971 as a sixth grade teacher for the Metropolitan Separate School Board (now the Toronto Catholic District School Board). After a brief period as an editor with Thomas Nelson & Sons, during which he published his first book, Cutting returned to teaching, this time in Chelmsford, but continued editing and writing when his schedule permitted. Cutting has since turned his attention back to writing and speaking on indigenous culture, heritage and history. He is the editor and author of Rubicon Publishing’s Turtle Island Voices series, a sequence of aboriginal books suitable for grades 1-8 that enriches the learning experience for all students with First Nation, Métis and Inuit perspectives. Following Cutting’s remarks, Father Maher conferred the degrees of bachelor of professional studies in education and master of science in educational leadership on the graduates. NU also presented its St. Louise de Marillac Award for Outstanding Service to Dr. Ashleigh Molloy, a global expert on developmental disabilities who adroitly juggles roles as a keynote speaker, adjunct professor, author, presenter and member of Niagara University’s Teacher Education Advisory Committee. Possessing bachelor’s and master’s degrees from the University of Toronto and a doctorate from Cambridge International University, Dr. Molloy has taught special education at the elementary, secondary and college levels. One of his most significant achievements has been organizing an annual international education symposium that brings together diverse cultural groups as a means of building bridges of understanding and respect for differences. Among the numerous organizations that have benefited from Dr. Molloy’s benevolence are the Ontario chapter of the American Association of Intellectual and Developmental Disabilities, and the Down Syndrome Association of Toronto. He has also presented his expertise at the World Down Syndrome Conference, held at the United Nations, and his work in international disability education has been recognized by the governments of countries in Asia, Africa, Europe, and North and South America. He currently serves as president of TransEd Institute, a global leader in transformative professional development. Niagara University, a Catholic and Vincentian institution in Lewiston, N.Y., offers bachelor’s and master’s degree programs in teacher education and educational leadership at sites in Toronto and York. The university, founded in 1856, has written consent from the Ontario Ministry of Training, Colleges and Universities to offer its programs, which are accredited by the Ontario College of Teachers. It has offered education programs in Ontario for more than 30 years.